My love affair with broccoli continues. 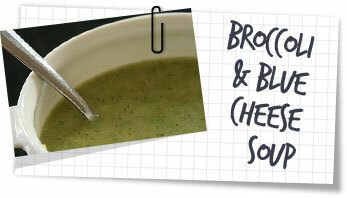 Its combination with blue cheese in this soup is just wonderful. It worked a treat! However, the leftovers stayed that day too long in my fridge and removing them was quite traumatic. Make sure you eat everything! Heat a large pan with the butter over a medium heat. Fry the leek gently for 4-5 minutes until soft. Season well with salt & pepper. Add the milk, stock, broccoli and bay leaf and bring to a boil. Reduce the heat to low and simmer gently for 20 minutes until the broccoli is soft. Remove from heat and fish out the bay leaf. Blend in a blender in batches until very smooth then pass through a sieve to get rid of any lumps. Put back into a pan and cook until hot, but not boiling. Add the cheese and stir well until completely melted. Check for seasoning just before serving. As with any soup – lots of fresh crusty bread.